The result is a modern oriental based on sandalwood — Indian sandalwood, said to be from a sustainable source (other notes: bergamot, lemon, saffron, nutmeg, clove, jasmine, sandalwood, patchouli, violet wood, vanilla, sacraosol, Peruvian balm and musks). The opening is a soft but unpolished (not rough, exactly, just not smooth as the later stages) blend of woods and citruses; the notes settle slowly into a lovely milky wood, pale and soft and lightly spiced. It's not foody and it's no more than mildly sugared, but there's perhaps the vaguest suggestion of those speculoos biscuits, and it has something of a comfort scent aura about it — it almost, but not quite, goes into my own wood pudding category. As it dries down, the transitions are gentle; it does get slightly duskier and edges closer to a floral musk. The lasting power is quite good, but it's one of those nearly transparent skin scents that's a mood as much as a perfume — that's the "modern" part of "modern oriental", perhaps. Denyse at Grain de Musc called it "surprisingly introverted" and Victoria at Bois de Jasmin found it "surprisingly low key". Certainly, it's more sedate, less risky, less playful, than the fashion. Perhaps because it is so quiet — it forces you to lean in and pay attention — minute changes in wear seemed more noticeable than usual. On some wearings, it was briefly pencil-ish (I like pencil-ish myself), at other times, it veered closer to the waffles than the biscuits and I understood why some wearers apparently found it too sweet. Verdict: Dries Van Noten par Frédéric Malle is quite likable and easy to wear. Some perfumistas may see that as a backhanded compliment, but it's not meant as one. I'd place the Dries van Noten fragrance in the same class as Diptyque Volutes or Parfums DelRae Panache or Hermès Eau des Merveilles— "a sort of second skin fragrance, something that lingers and pleases without being dull, and without wearing you instead of the other way around", to quote myself. More than once while wearing it, it occurred to me that if I was going to have a signature scent, and really wear it all the time, this is exactly the sort of understated elegance I could live with day in and day out. Still, both the Diptyque and the DelRae made my buy list and the Hermès I actually purchased; this one, I'm still making up my mind. Either way, Mr. Van Noten should be pleased — his fragrance is no doubt vastly better than what he would have under his name if he'd gone a more conventional route. 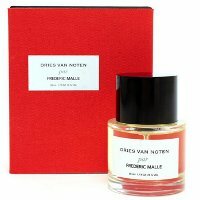 Dries Van Noten par Frédéric Malle is available in 50 ($185) and 100 ($265) ml, or in three 10 ml travel sprays ($125). For buying information, see the listing for Frédéric Malle under Perfume Houses. Note: top images via driesvannoten.be. 2. Mind you, it only took a few more minutes online to determine that haute couture or no, Dries van Noten does not actually produce any items that I can afford, and that very few of his products are sold online in any case — it is not exactly a "clothing for the masses" sort of brand. Still, it's a nice gesture. When the Dries van Noten for Target collection appears (hey, you never know) perhaps I'll stand in line. I do like that grey coat. 3. Again, quote via press materials. I’ve read somewhere that Malle wants to do like 30 fragrances in this “??? par Frederic Malle” line. I tried Dries Van Noten last week but I didn’t like it much. The day I wore it it kept reminding me about it’s presence which in my case is a bad thing – perfume I love don’t need to remind me that I wear them. Generally I found it sweeter than I wanted. You’re not alone. But other than a few brief moments here & there, it doesn’t really read as overly sweet on my skin. But have seen it referred to as caramel! It all depends on personal skin chemistry. I wouldn’t compare it to caramel, to me it smells more like a pudding, a wood pudding as you described it. Edgy designers rarely do edgy fragrances, though. This is less mainstream than most such efforts, to me — Flowerbomb being the most glaring, but also things like Maison Martin Margiela Untitled. I absolutely agree. I suppose Maison Martin Margiela Untitled is not a bad fragrance, but in my mind it totally misunderstands Margiela! My explanation for it is that Martin Margiela is anyhow not designing for the brand anymore, so it is just sad … But I was expecting something more curious from Van Noten. However, I have to admit that my nose does not like vanilla, so I am super biased. Would you say that Comme des Garcons is an exception? Even though their latest fragrances may have not been as great as usual, Comme des Garcons was able to translate their edgy design into their fragrances (or, better to say: they stayed consistent across). Let’s hope things don’t change radically. Yes, CdG has been more adventurous than most, esp. early on. Will also add that wouldn’t really have expected edgy from Frederic Malle — would have expected great care with development & excellent quality materials, which I think are the hallmarks of his line, and that is reflected here. Thanks, Robin, it sounds like it might be worth a try. The description of soft, pale sandalwood makes me think of Lumière Blanche but I’m not sure if you’ve if had a chance to try that one yet. I should probably go read Victoria’s and Denyse’s reviews and see if they make any comparisons. I have not, and may never — I have come to terms with the notion that I will NEVER catch up! Don’t think either V or D mentioned it though. I was looking forward to your review of DVN! I suppose I will just have to satisfy my cravings for speculoos (gingerbread) some other way. Like you, I got more woods and musk than the foody gourmand notes. It’s not that the gourmand notes are not there, but they are not as prominent to me as some other elements. Overall, I thought that it was very well-done, and if it had more projection on me, I would be buying a full bottle. V, I have a feeling that I won’t end up buying it either, although hate to say because sometimes these things really grow on me, and I really did enjoy wearing it. I don’t mind the lack of projection, really, but think I might like it better if it was a little less sober. More cream, more gingerbread, more spice? Not all at once, but a bit more of one of them? There was a Dries van Noten tunic I saw at a store last year that I really wanted. However, though I have been known to splurge sometimes, I have my limits and sadly, it was above them. Hah! The one I wanted was _only_ $900. That’s cute but I’m definitely not seeing the multi-thousand dollar price tag. It also seems like it would be not too difficult to find tribal print cloth and have a tailor make it up. Print that picture! Ha, you’ll take care of that for me then, yes? I surprised myself by loving this one. Lately, I dislike almost anything with musks listed in the notes. Too synthetic, too blinding, too “modern musky”. But the balance of spicy gourmand, wood and floral notes on the soft musk base worked very well on my skin. I wouldn’t call it edgy by any means, but it’s different. I can’t think of anything in my collection that would substitute for it. Wood pudding makes me think of Douce Amere, which is so much more forceful. The Dries Van Noten scent wears more like a veil. And I don’t think I have a wood pudding veil in my collection, so maybe this will go on my buy list. Wood pudding veil — that does sound nice! Now I’m wishing again that it was a bit creamier. A mainstream spicy woody veil, not pudding, would I guess be Marni. I will be surprised if I don’t care for this one. However, I’ll also be surprised if I care for it enough to drop $185 (instead of finally splurging on, say, my beloved Une Fleur de Cassie, which I think is also $185 for 50 mL). While I appreciate understated elegance — my collection is chock-a-block with things like Volutes and Eau des Merveilles — I want something with some definite bang if I’m going to spend the big bucks. Is that weird and wrongheaded? I know it must be just as hard to craft a well-made skin scent and that the raw materials can be just as exquisite, so this prejudice really makes no sense the more I think about it. Gosh, I don’t think it’s weird or wrongheaded — if you want some presence, you should have it! I don’t see that as a prejudice, just a personal preference. It *is* a consumer product, after all. Oh I was so ready to love this one – it sounded perfect. I’ve tried it a few times now and each time I’ve not even made it to the dry down. I have to wash it off. There’s something in the texture (if you know what I mean) of it that sets me on edge. The reports of too much sweetness fascinate me. I get no sweetness at all. I just put on a drop of Bois des Iles to get a cookie and sandalwood fix. If anyone in Australia is interested in getting the rest of my sample let me know! Talking of Australia I think I read somewhere that the Indian sandalwood used in this was grown in Australia. Interesting! I don’t get much sweetness either, most of the time, but not really sure what you mean by texture. And hey, really? It seems really misleading to call it Mysore sandalwood then . The variety of Sandalwood tree IS Indian but it’s definitely grown in Australia so yes it is misleading if they are calling it Mysore. It’s possibly the same variety that grows in Mysore. This is the company that’s producing it I think. hmmmmm what DO I mean by texture. I guess I don’t find it smooth at all – more sort of raspy and not enjoyably raspy. The Malle line is very expensive — the only real bargain is to split the travel trios. I don’t suppose I can use this as an excuse to keep waiting for the coffret, huh? If they are separate lines, I expect I can’t hope that it will be added to that little treasure box . . . Thanks to the unexpected generosity of my new favorite SA and to another sample won in a draw I’ve had enough Dries Van Noten to wear every day for the past week. The biggest surprise to me is that I’ve actually wanted to wear it every day. Usually I’m much more fickle than that. I think the thing that’s got me hooked is that the sandalwood in this is really just that good. Maybe it’s not quite up there with my treasured vintage Bois des Iles, but at least it’s close enough to bear comparison. I very much like how uncluttered and coherent this perfume feels. Because of that I strongly suspect that it’s going to be a good layering perfume. I think I’m going to start with the similarly gorgeous vanilla in 7 Billion Hearts. Interesting about layering — you might be right! Not sure I like the idea of using such an expensive scent to layer though. Will have to think about it. Well, I tried it and am happy to report that I found the combination of Dries and 7 Billion Hearts to be as thoroughly soul satisfying as I’d hoped. There are many perfumes I would never dream of layering, expensive or not, but I’m pleased when I find one that will allow it. Especially with a fairly costly bottle it’s nice to be able to vary the scent a bit to suit one’s mood. Now I’m wondering if Dries might welcome a touch of iris for another variation. I’m finding it to be a very approachable perfume in all kinds of ways. I love love love sandalwood, but am not a fan of speculoos, unless it’s the artisanal kind you can find in a good bakery, and I am not sure I want to smell of speculoos. (I’m from Flanders, like Mr. DVN, so I know my cookies). This scent is definitely intriguing and I hope I can find a sample somewhere here in my country of residence (Jp). I don’t think you’ll find it all that foody. Some people do apparently find it too sweet, but it isn’t that much like cookies. Hm so interesting! I’m curious how it compares with Santal Massoïa. (And now I think that’s what I’ll wear for the rest of the evening!) Anyone have thoughts? Similar? Totally different? Good question – I always forget about Santal Massoïa, & they really are in the same ballpark. The FM is woodier, more directly about sandalwood; Hermes is softer & smoother, fruitier, probably closer to feminine although both are reasonably unisex. Of the 2 I think I like the FM best — I like Santal Massoïa but it never did really grow on me past that. That Santal Massoïa doesn’t stick in your brain is probably a verdict of its own on that fragrance! But I’m glad to hear they feel reasonably similar, and also that the difference is the Malle feeling more woodsy. Allays my fears provoked by all the FM promotional material mentioning Belgian waffles! Well, do note that some people found the FM much sweeter than I did! I bought the Santal Massoia because I love sandalwood and trust Ellena but the “santal” was barely there and something vaguely sour took the stage after the first act. I hope I like this one. Meanwhile I just keep going back to Chaos. Which I suppose is better than Running Amok. I tried this, found it nauseatingly sweet, not my thin at all.